Bali Collection can be the best place for you to go shopping in Nusa Dua. 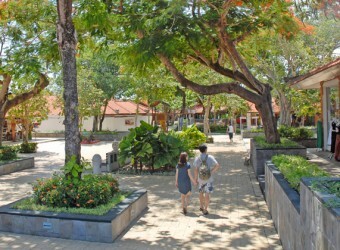 This shopping and entertainment complex is located in the tourist area and large international 5-star resorts. The shopping center has beautifully landscaped gardens, pool and ponds. Uluwatu, Bamboo Blonde boutique and other boutiques can be found at the centre of SOGO, and other shops. It was the first time for me to go to Starbuck in Bali! The price is not so different with Starbuck in Japan. I could spend my time to relax at Starbuck in the southern country. Bali was very hot.